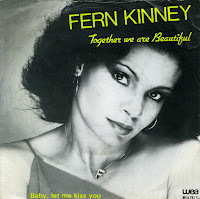 Fern Kinney began singing in the late Sixties. She joined the vocal group The Poppies, replacing the previous singer Patsy McClune. In the early Seventies she also started working as a session musician. Having settled as a housewife, Kinney finally tried to attempt a comeback with 'Groove me'. The next single 'Together we are beautiful' became a surprise worldwide hit. Originally recorded by British vocalist Steve Allan eighteen months earlier, Kinney made it a sultry disco hit. It didn't reach the chart in her native America, but in the UK it became a number one hit. It also reached number 24 in the Netherlands.